I was a tomboy as a child and a jock as a teenager. But that was years before Title IX spawned organized women’s teams and college scholarships. This might explain why my sport of choice was figure skating (despite my five-feet-eight frame and five-feet-ten legs). Dressed in pretty sequined costumes and makeup, I twirled and jumped my way to a decidedly mediocre competitive career. It was actually worse than that—my best finish was third in one competition. Oh, if only someone had put a basketball in my hand when I was ten and already a lanky five-feet-five. Well, the truth is that someone did—but I was only about six. And in those days, the rules were strange for women. There were six players, only three of whom could cross half-court. Since I was big, I was relegated to standing behind the line and playing defense. It was really boring! That is why I was cheering when the WNBA season tipped off in May. Several years ago, when I was secretary of state, I spoke to the league’s women’s achievement luncheon. I told the athletes how much I envied them, playing a sport in which you can actually sweat and grimace when something goes wrong. In skating, even after the most humiliating and painful falls, you were expected to get up and smile. This even though your dress was plastered to your body—courtesy of the puddle that skaters always seemed to find when they hit the ice. In women’s basketball, you can look as if what you do is hard and takes great athleticism. And I love that these women work as a team—learning that in the trenches you are only as good as the person next to you. Great friendships come from pursuing a common, measurable goal. These athletes learn too how to recover from bad performances and get up the next day, work hard and do it all over again. Sort of like life. I told the athletes how much I envied them, playing a sport in which you can actually sweat and grimace when something goes wrong. Teaching at Stanford, I have seen how intercollegiate athletics promotes the development of focused, confident young women. It isn’t easy to balance academics and athletics, and I’ve seen both male and female athletes do it well. Nationally, however, women’s athletics has had fewer problems with academic standards than big-time men’s programs. Some say this is because women are not subject to the siren call of professional sports. For too many male athletes, college is just a pit stop on the road to the NFL or the NBA. Probably true. But I want to see women, too, put their talents to work at the next level. I want them to be able to make a living at what they do best and still long to do when college is done. That is why I want the WNBA to succeed—along with the LPGA. I also hope women’s soccer will return and that one day women’s professional softball will be born. To be sure, the product has to be good enough to sustain a fan base. 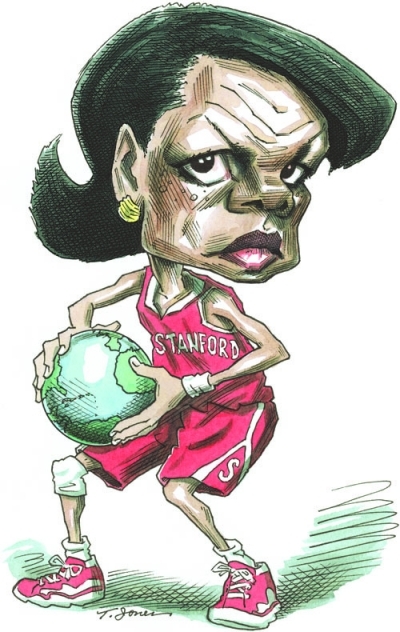 I admit to a bit of discomfort watching the championship game between my beloved Stanford Cardinal (not the Lady Cardinal, just the Cardinal) and the Connecticut Huskies last April in San Antonio. Even though Stanford led at the half, my heart fell with each missed layup on both ends of the floor. I said to my friend Lori White, who is also a fan of women’s basketball, “Do you think the audience is tuning out?” We decided that the low score was evidence of really great defense. Women’s basketball and the WNBA have work to do even with devotees of the game. Owners like my friend Sheila Johnson, of the Washington Mystics, know that the game has a long way to go and are tirelessly trying to improve it. Yet there is a lot to work with. After all, the second half of that NCAA final game was terrific. The Huskies’ Maya Moore and Tina Charles started hitting their shots, and the place went crazy. Stanford made a furious run but Connecticut held us off. These women could really play. I watched Jayne Appel, our six-feet-five center, wince in agony from the hairline fracture in her ankle that had hobbled her for much of the season. But I knew that for this very tough athlete and team leader, the end of Stanford’s title hopes—her last chance to be a national champion—hurt even more. And then there was Charles, basking in the glow of another undefeated championship season. But it had to be bittersweet, since her incredible run as a college superstar was over. I thought to myself, “It’s not the last time Jayne Appel and Tina Charles will meet.” They’ll see each other again in the WNBA. That’s the way it should be. And I’ll be watching. Available from the Hoover Press is Bringing in a New Era in Character Education, edited by William Damon. To order, call 800.935.2882 or visit www.hooverpress.org.